War was an inevitable part of the Middle Ages and Renaissance. And this kit would have been designed for those bloody battlefields. Each piece in this kit is hand forged entirely in carbon steel, and weathered to look as authentic as possible. 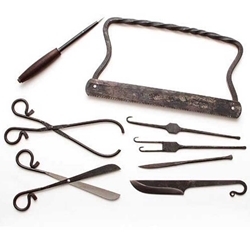 The set includes eight distinctive pieces, including one bone saw, one hinged clamp, one hinged scissor, two bistoury knives (one large, one small), one pick-probe and two hooked apparatus (one singular, one double-headed). Includes compartmented leather pouch. Though each piece is functional, this kit is not designed for actual medical use by today’s standards. Great for re-enactment, educational display or medieval decoration.